Boston’s Copley Square is notorious for its amazing architectural beauty, which is one of the many reason Copley Square apartments appeal to Boston renters and buyers. Originally the site of MIT prior to it moving to Cambridge, Copley Square is actually a square in shape as a result of the streets being reconfigured in 1994. Copley Square is located in the Back Bay, boasting a lush park along with its beautiful buildings. Copley Square’s buildings vary from old and well-maintained to new, so Boston renters have a number of different styles to choose from in terms of Copley Square apartments. If you are considering renting a Copley Square apartment, you’ll have access to some truly amazing pieces of Boston history. Trinity Church is the most prominent of all the landmarks on Copley Square with its giant arches and tall tower. It is considered to be one of the top ten buildings in the US. Sitting on one of the corners of Copley Square is the impressive Boston Public Library, the first publicly-supported municipal library in the US. Boston Public Library lays claim to being the library that houses the personal library of former President John Adams. 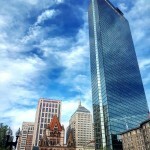 Also located on Copley Square are the three John Hancock Insurance buildings. Once the second tallest building in Boston, the old John Hancock Building has been renamed the Berkeley Building. Standing as the tallest building in New England at 60 stories high, the John Hancock Tower is known for its beautiful blue-tinted glass.